Last night I had the pleasure of celebrating with my dear friend Dr. Ade Banjoko. I've known Ade for several years now and last night she was celebrating her 60th birthday. Again I was reminded how well black folks age. I'm sorry Ade but for a 60 year old you're still pretty hot. Ade is one of those unique individuals that combines beauty and brains without conceit or elitism. She is a leader for the African-American community and a mentor for many in the LGBT community. I met Ade in 2004 when I was volunteering with AIDS Project Arizona. I was doing my regular outreach duty - handing out condoms and HIV info at any venue I could get into that had black folks. Outside of Club Incognito she hit me up with a request. She told me she was a biology instructor for Chandler- Gilbert Community College and one of her classes was about to go into their studies of HIV. She asked if I could do a presentation on HIV and how the virus works in the body. I'm all about going anywhere that I'm invited if I'm able to address people about HIV/ AIDS, so I immediately said yes. I've never shared this with Ade, so she'll be finding out with everyone that reads this - child, I didn't know a thing about how HIV really worked in the body. My job as an outreach person consisted of me telling people how not to get it. I knew that the virus often mutated and I knew the immune system did not know how to effectively eliminate it. That's pretty much all I knew. But I'm a pretty sharp cookie myself. I had all the resources I needed to put together a presentation. Within the span of a week a put together a college level presentation regarding HIV modes of transmission, cellular reproduction of the virus, the virus' lifecycle, etc. I was pretty impressed with what I put together and I was very pleased with how it went over for her class. I'm happy that I was presented with that challenge because you wouldn't believe how often I was able to put that information to use following that presentation. Dr. Banjoko jokingly calls herself the dancing plant doctor and it's such a perfect title. Her studies at Arizona State University yielded her a BS in Botany and a PhD in Cell Biology. 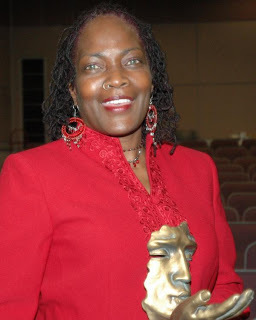 She was recognized by Soul Purpose Arizona at their In The Life Celebration for her excellence in education and she was honored at last year's Martin Luther King celebration for her continuous commitment in working with youth. She was also a member of the Kawambe Omowale African Drum and Dance Theatre (Arizona's premiere African dance company) and she studies belly dance. Hard to believe a person this active is a great grandmother. Ade, you not only inspire me, you inspire so many people around you. I appreciate your spirit and brilliance and your authenticity. Keep walking in congruency, letting the life you live reflect the words you speak. To see more pics from her celebration go here. I'm still learning from this wonderful woman, and blessed that she is my mother.